JYM Supplement Science combines real science with best-in-class ingredients and precise doses to deliver unreal results. Pro JYM is my exclusive protein blend designed to help you build muscle, recover faster and train stronger. 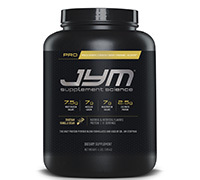 Whether you want to boost strength, add size or get shredded, Pro JYM is for you. It’s a powerful blend of proteins that add up to pure muscle fuel. Each scoop of Pro JYM delivers 24 grams of pure, quality protein. It’s not “spiked” with single amino acids to artificially increase the protein content or made with cheap and inferior whey protein concentrate or caseinates. To make Pro JYM, I selected only the highest-quality whey protein isolate, micellar casein, milk protein isolate and egg white protein (egg albumen). While a high-quality protein powder should be at the top of everyone’s supplement shopping list, don’t make the common mistake of buying a pure whey protein powder right off the bat. Yes, whey protein is a critical staple for muscle growth, but to truly maximize growth, you need more than just whey. You need a precise blend of performance proteins. Whey is a very fast-digesting protein. The rapid rate of digestion is one of whey’s benefits, but on its own, this quality can actually be a downfall. Because whey digests so fast, it quickly boosts muscle protein synthesis (MPS). However, it only boosts MPS for a short amount of time. In fact, research confirms that people who add slow-digesting casein protein to a whey protein shake around their workouts enjoy greater muscle growth over time than people taking whey alone. This research is the very reason I recommend taking a blend of fast-digesting whey protein, medium-digesting egg protein and slow-digesting micellar casein. Many people think that extra amino acids in their protein powder are beneficial. The major problem, however, is that certain amino acids are not added to make the protein powder more effective. Instead, they’re simply added for their nitrogen. Most single amino acids, such as taurine and glycine, are much cheaper than whey protein, casein protein, milk protein or egg protein. Even highly beneficial amino acids like BCAAs and glutamine are cheaper than protein powder. So, by adding a bunch of cheaper amino acids to their protein powders, supplement companies can boost their nitrogen content, which technically means they boost the amount of protein per serving, at least according to the nitrogen test. An even bigger problem arises when proteins are spiked with amino acids that aren’t used as building blocks to form proteins in the body. Taurine is once such amino acid. Taurine helps with energy production, so you might first be excited to see a high quantity of it in your protein. However, if 5 grams of taurine has been added to your protein powder that claims to contain 20 grams of protein per serving, you are only getting 15 grams of real protein and 5 grams of taurine. So the extra taurine comes at the expense of total protein. As with every other supplement in the JYM line, I want you to know the exact ingredients and doses in Pro JYM. I want you to see that it contains nothing but a pure blend of high-quality proteins in the exact amounts needed to maximize growth, recovery and repair. In short, I want you to grow like a pro. Prepare to experience the power of real science, real ingredients and unreal results. Boirie, Y., et al. Slow and fast dietary proteins differently modulate postprandial protein accretion. Proc. Natl. Acad. Sci. USA 94:14930–14935, 1997. Reidy, P. T., et al. Protein Blend Ingestion Following Resistance Exercise Promotes Human Muscle Protein Synthesis. J Nutr. 143(4):410-416, 2013 . Soop, M., et al. Coingestion of whey protein and casein in a mixed meal: demonstration of a more sustained anabolic effect of casein. Am J Physiol Endocrinol Metab. 2012 Jul 1;303(1):E152-62. Kerksick, CM, et al. The effect of protein and amino acid supplementation in performance and training adaptations during ten weeks of resistance training. Journal of Strength and Conditioning Research 20(3), 643–653, 2006. Paul, G. L., et al. The rationale for consuming protein blends in sports nutrition. Journal of the American College of Nutrition 28 (4):464S–472S, 2009. Tipton KD, Ingestion of casein and whey proteins result in muscle anabolism after resistance exercise. Med Sci Sports Exerc. 2004 Dec;36(12):2073-81.